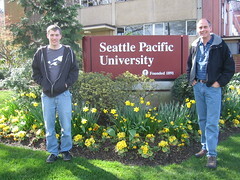 Friday we went to SPU for a tour and some appointments with admissions and financial aid. Markus has been accepted and is considering SPU. Esther and I needed to talk to financial aid to help us get over 'sticker shock' With Markus' academic scholarship and some 'need based' grant money, the out of pocket comes down a little, but is still pricey compared to other options. I was once again impressed with facilities and strong academic program at SPU. It's hard to imagine that I spent over a year in graduate studies at this school. One very 'coincidental' experience was that in my efforts to set up appointments I was helped one of Bjorn's friends - 'Boone'. After graduating from Trinity last year, he worked in Portland for several months before recently taking a job with SPU. It was good to touch basis with him as we share flickr photos. It was good to see you too! That was pretty funny when I asked if you were Bjorn's Dad over the phone. Good to see you. Adios.